The Duchess of Sussex was in a green Erdem ensemble for this morning’s visit to Canada House with Prince Harry. 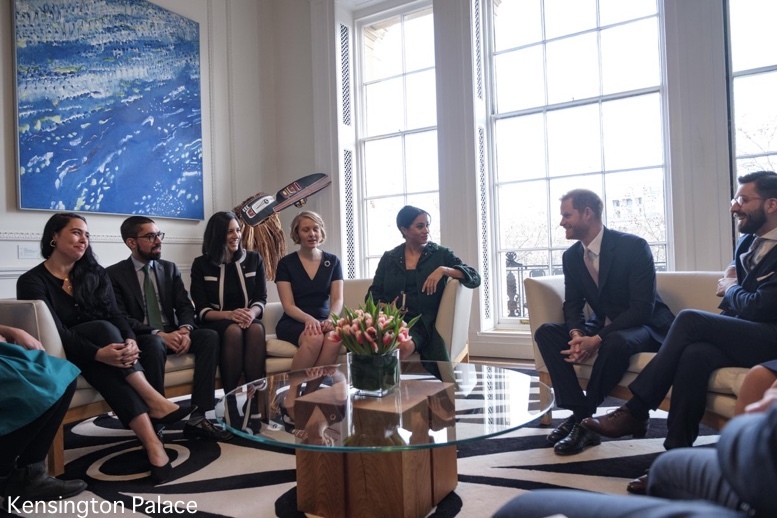 🇨🇦🇬🇧 The Duke and Duchess of Sussex are marking #CommonwealthDay by celebrating the diverse community of Canadians living around the UK. The event was aimed at celebrating the diverse community of young Canadians living in London and around the U.K. There is a strong, historic bond between the two countries with a dynamic and vibrant community of around 500,000 Canadians living across the U.K. While there the couple met young Canadians working in fashion, the arts, business and academia. 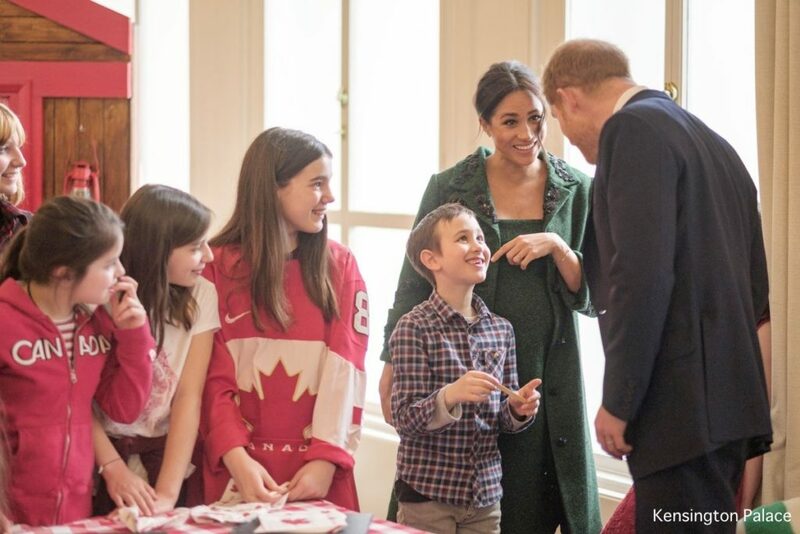 Meghan and Harry also listened to a brief speech by Canadian High Commissioner Janice Charette and watched a musical performance. They probably had the most fun learning how to make maple taffy. Here is a quick video. 🍁 Joining young Canadians demonstrating the Canadian spring tradition of making maple taffy. Making the candy from maple syrup is part of a traditional “Cabane à sucre” or a “Sugar Shack,” a spring tradition. 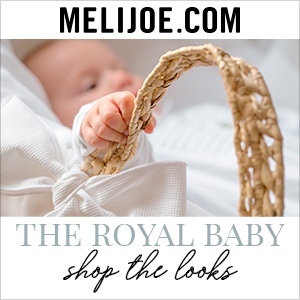 Before departing, they were given gifts for Baby Sussex; a £14.29 Canadian maple leaf baby bodysuit from Hop & Moo and a pair of £42.86 Manitobah Mukluks infant moccasins. Lizzie Robinson of ITV reports Harry sang a few lines from the Sound of Music. 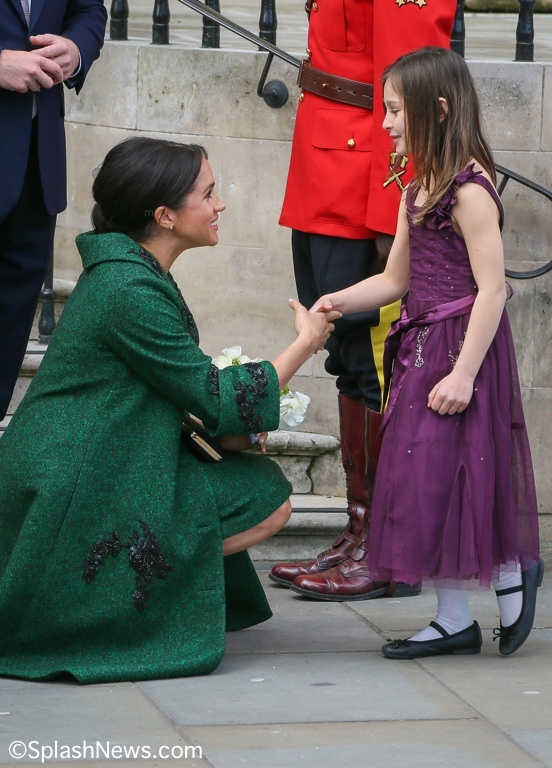 Meghan was also presented with a posy by 9-year-old Asya Karkaria and 8-year-old Michael McCarthy. Both children are from Ottawa and their parents work at Canada House according to Rebecca English’s Daily Mail story. 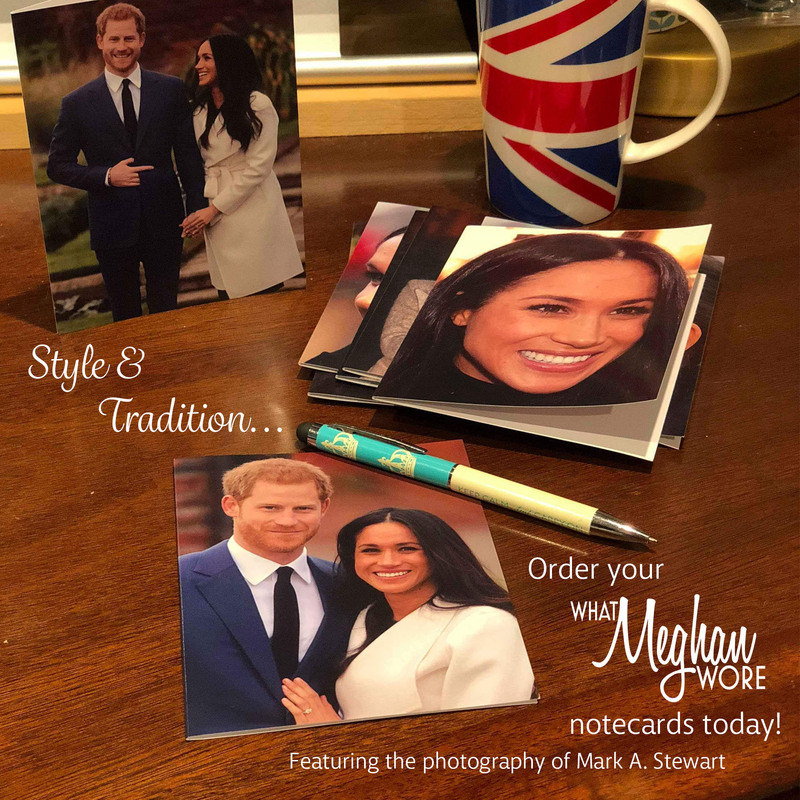 Now for our look at what Meghan wore. The Duchess demonstrated some sartorial diplomacy, wearing an ensemble by Canadian-born designer Erdem Moralıoğlu. Of course, Meghan lived in Canada for six years while filming the television series Suits. 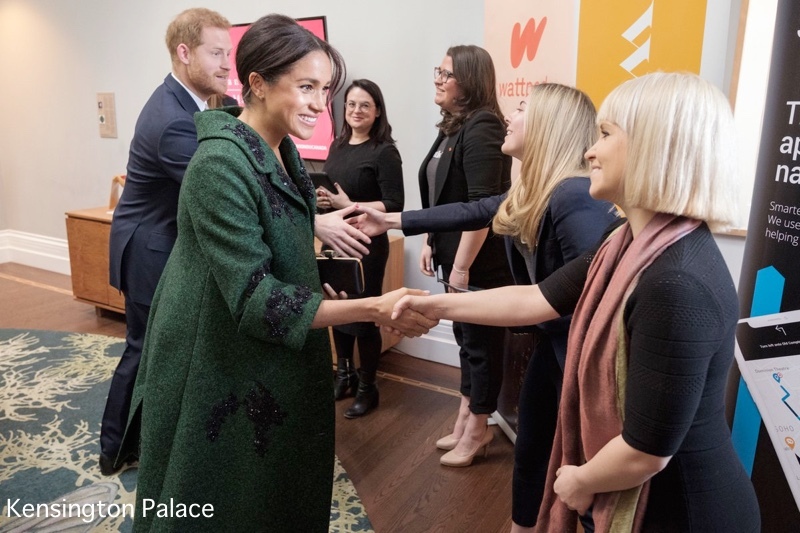 As Laura pointed out, Meghan’s coat is based on a piece from the designer’s a/w 2019 collection. In fact, it was the designer’s first look down the runway at last month’s fall show. We show it with another piece from the collection, a suit using the same fabric and embellishment. 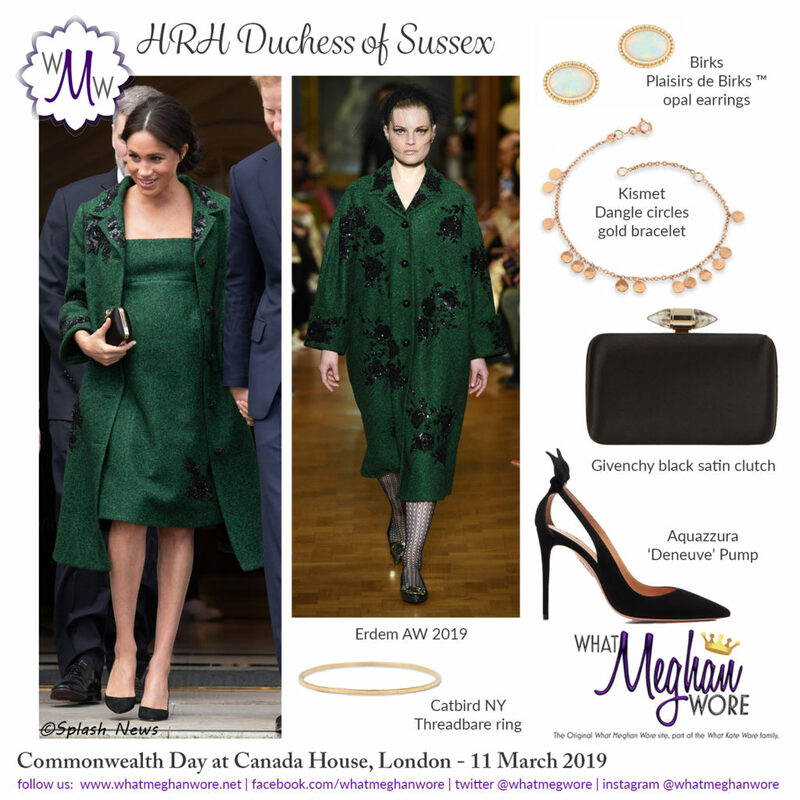 Meghan’s 60s-inspired wool coat is midi length and features bracelet-length sleeves, wide cuffs, and oversize beaded buttons. The piece is embellished with a rose pattern created in black beads and sequins. The Erdem coat dress, a step away from her usual more casual style, featured embroidery bearing the same name as her mother, who lives in Los Angeles. 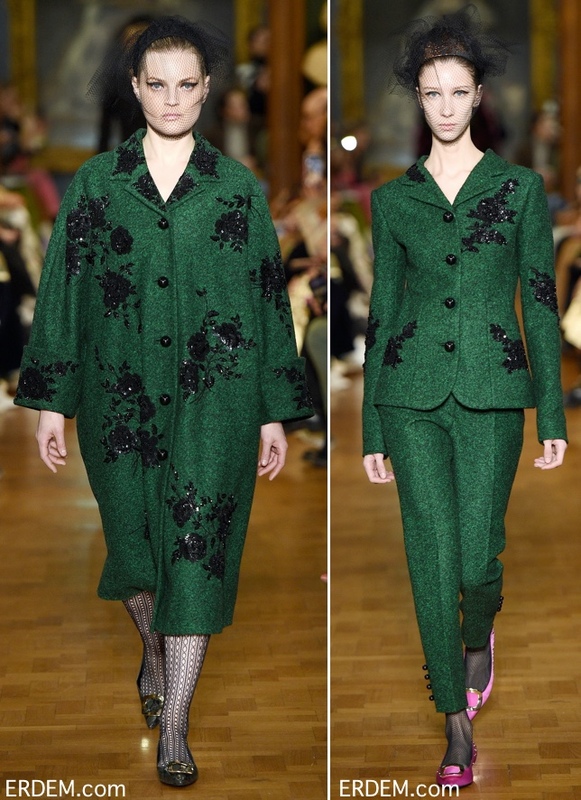 A spokeswoman for Erdem told Express.co.uk the appliqué was called “Doria beaded rose embroidery”. You can just glimpse the matching dress beneath the coat in the photos of the couple as they leave. The Duchess accessorized with her Givenchy black satin clutch with its distinctive jeweled clasp. 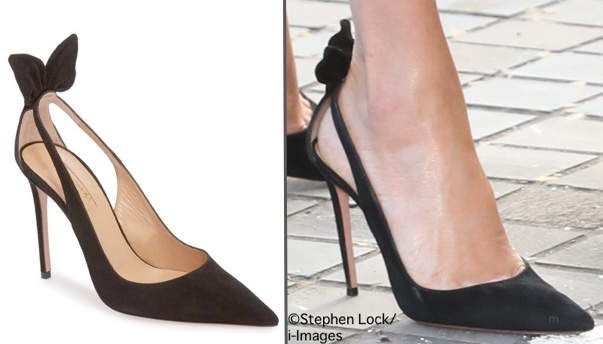 And Aquazurra Deneuve pumps in black suede. She wore earrings by another Canadian brand, Birks. Meghan wore the Pétale style earrings, first seen at the photocall when the couple announced their engagement. 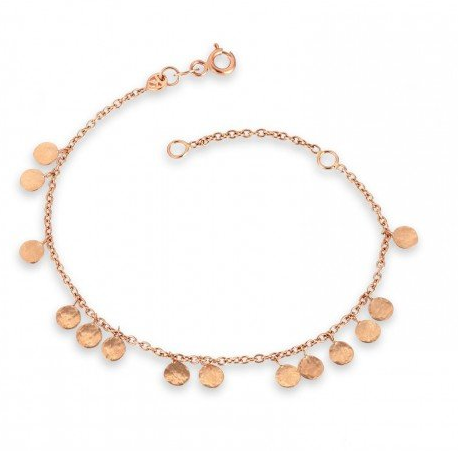 It looked like the Duchess also had on her Kismet by Milka ‘Dangling Circles’ bracelet ($475). We will see you shortly for the Commonwealth service at Westminster Abbey! 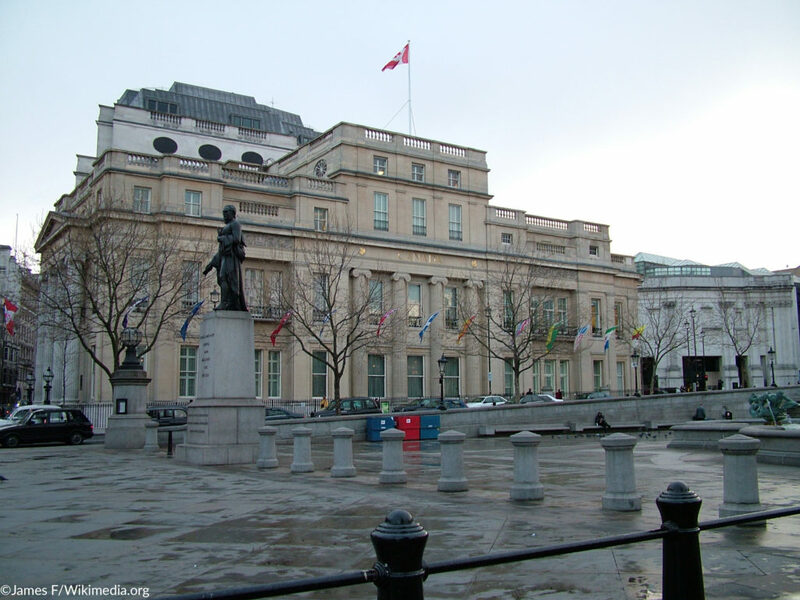 So a bit off topic but it is related I promise: In high school I attended an all girls’ Catholic school and did an exchange in Dublin, Ireland at another all girls’ Catholic school that was part of the same network. The Irish girls’ uniforms was this long wool skirt they apparently had to wear year-round, even during fall/spring in warmer temperatures. I remember having to wear my uniform when visiting the school and feeling so out of place with my shorter kilt. My host student said they nicknamed the skirts “carpets” because they were so heavy and that was the first thing I thought of when I saw Meghan’s outfit haha! It also reminds me of golf turf/astro turf. These are not bad things, these are just the first things that popped into my head. I really like this outfit on her, the color is great and a nice change from the parade of neutrals. I’m also glad she had the dress/coat altered and didn’t have as many embellishments. I know some people think the coat looks unfinished but all those embellishments on the runway model are a bit overkill for me. The back of the coat at the collar does look a little roomy–maybe Erdem made it a little too big thinking she might be bigger at this stage in her pregnancy? That’s the only thing I noticed that looked off to me. 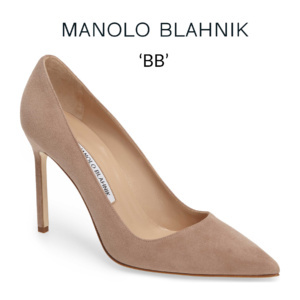 Nice to see her fave shoes reworn, I’m amazed she can still wear them! The coat and dress are both a lovely fabric and colour for this time of the year. I liked the coat when she had it done up. The bare neck looked too open otherwise, perhaps a small piece of jewellery? I don’t know, something was off there. I don’t like the pencil thin high heels. Very non proportionate for the heaviness of the fabric/coat, and the bare legs are just too stark with such high thin heels. I agree with the other poster who mention that she really does need to ask for advice when/how formal or informal an engagement is going to be, It baffles me that she gets it wrong so often. However she looks happy and seems to be glowing. I love the Duchess and think she is doing admirable work. I share others’ opinion that this outfit seems awkward for the occasion. The neckline of this dress seems too low. I can’t imagine that I’m the only one who feels uncomfortable for her. Looking at this photo, I feel like she might be cold and I feel bad for her. Her chest looks so bare with that low neckline, and the look is further exacerbated since the fabric is heavy wool and weather can’t be all that warm. The beading doesn’t bother me. I like it. The color is beautiful on her. The outfit is lovely and colour stunning, except that Meghan wore it as a summer outfit it seems. To look nice she should have worn dark stockings, possibly boots and a scarf. Otherwise as someone above said, it makes the outfit look stuffy and itchy. I like the color on the Duchess very much, but the whole outfit feels unfinished to me. There is too much of a gap between the back of the coat collar and the back of the neck. A necklace and/or scarf and/or larger earrings would have filled what to me is too much open space at the neck/upper chest. Really wish she would wear larger jewelry. The big earrings she wore in Morocco were quite flattering and would add some balance to the severity of the center part. Love the color of the coat & dress, but will someone please ask her to stop wearing high heels. Her balance is off due to pregnancy & lower heels would help with the balance. This outfit looks 100x better on her than on the runway! She pulls off the green very well! She looks absolutely gorgeous. I am impressed with the heals so late in pregnancy. 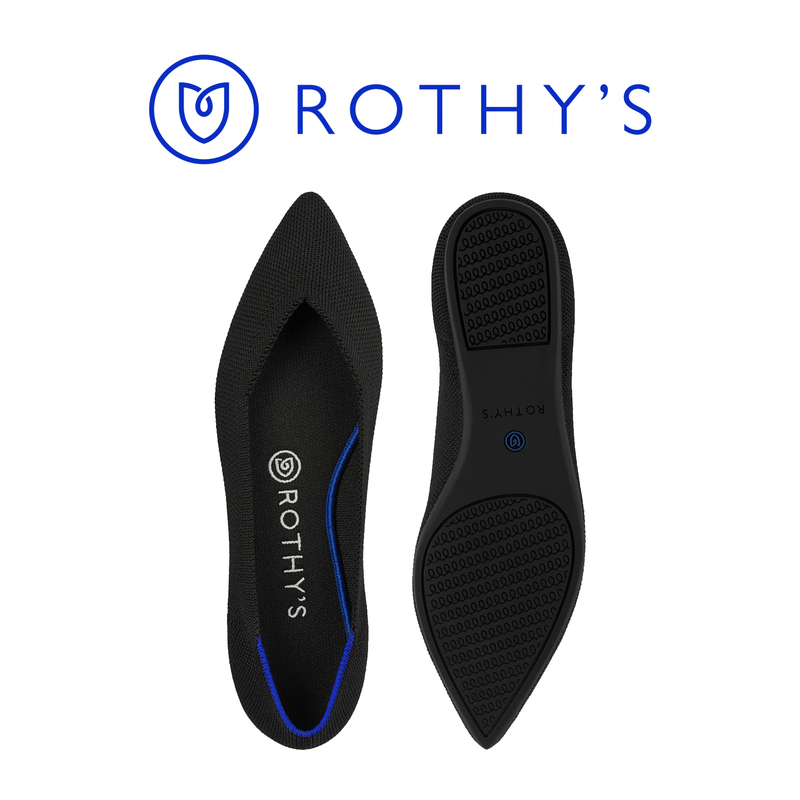 If I were her I would be rocking the black pointed Rothy’s 24/7. My first thought when I saw photos of this outfit was, love the color, Meghan looks really beautiful (which she always does, and particularly during her pregnancy I feel). Upon further observation I noted the vintage style, which has proven to be a welcome recent silhouette choice that flatters and also looks more comfortable. But overall I do think the heaviness of the fabric and the embellishments overwhelm her. Perhaps, if others have noted, this was worn in the evening it would not have seemed like so much material and decoration. However, the shoes really do work perfectly (and even though we’ve seen them so many times before they always seem to look fresh and feminine) and I even like her earrings which I feel like I’m seeing for the first time since her hair was down at the engagement photocall. I assume the Sussexes plan on having at least one more baby so it will be interesting to see what outfits make the cut and reappear the next go-around. Gorgeous coat. But just looking at a dress made out of coat material makes me feel SUPER itchy!! And that neckline in wool just seems off. I would have paired this gorgeous coat with a complementary green or black dress for a true winner. Well, I think this is brilliant. The color is very striking on her, and I like the modifications that were made–coat length, sleeve length, and it looks like somewhat more minimal beading. The cut is very wonderful–the way it swings so beautifully over her bump and swishes right at the knees, and then that dip of the collar in the back, like a kimono. Just very architectural and flattering at the same time. I love the loose, Bardot-like updo with the vintagey vibe of the coat. And the shoes were the perfect choice. A beautiful look. I love this outfit so much, I want to write an ode to it! I am the kind of girl who wears a sequence skirt with a chunky sweater and shobooties in the middle of the day…so, for me, this outfit works no matter the time of day. I love the neck line of the coat which dips in the back and the hapzardly placed black beading on the coat, and the cuffed three quarter sleeves. I loved when she opened the coat and exposed the unexpected neckline, which complimented the coat perfectly. This outfit is giving me the Jackie O vibe,like most of Meghan’s outfits of late. Add a pillbox hat and it seals the look. I share the confusion shared by other posters. I would love to see the whole neckline of the dress. It seemed a very summery cut for such a heavy fabric. The dress also seemed to lack the interest of the sequin design on the coat. 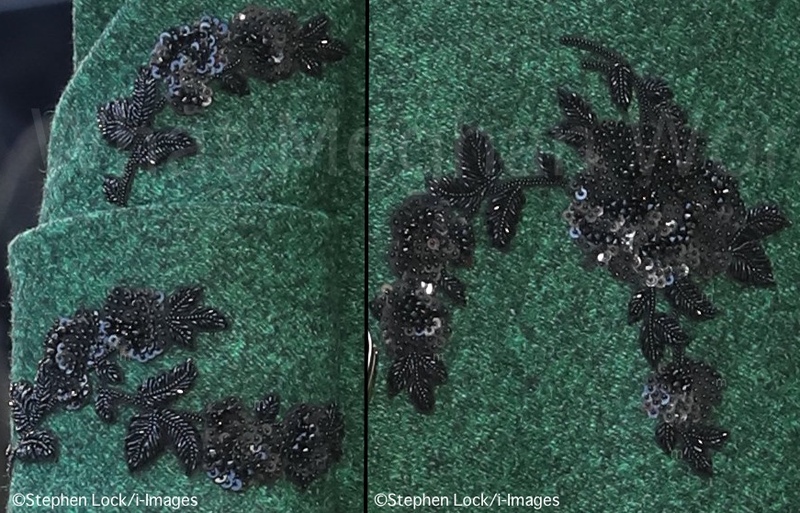 Some of the placing of the sequins on the coat seemed to look like creatures crawling up it but I guess that’s Erdem. I liked the coat though once I got over that. On the whole it didn’t seem to hang together as a winter ensemble. But she looks lovely and happy. Welcome into your closets the square neckline. 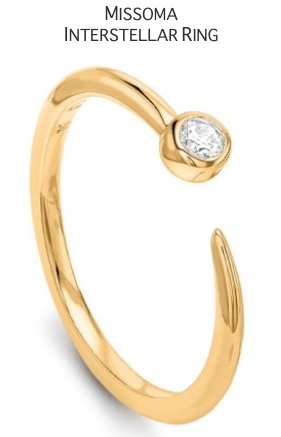 While its flattering profile may stem from the Renaissance era, the classical silhouette has made a modern comeback. I love it she looks terrific anytime, anywhere, and any season it works ! The colour is lovely and the black beading makes for interesting styling. I do agree that there might be just a bit too much beading. I’m usually not a fan of Erdem (HRH Duchess of Cambridge has worn a couple of awful Erdem dresses) but the colour of this coat is a plus. Having said that, I think the style of the coat does Meghan no favors. She appears to have a petite frame — even this far along in her pregnancy — and the coat just swamps here (as it does the model but that’s runway fashion). When the coat is open it falls too far off her shoulders and appears to have a lot of extra fabric. The sliding back from her shoulders and extremely wide neck opening without a necklace or larger earrings gives me the sense the coat is too large. I’m not sure that given the style this coat can be tailored post-pregnancy for a re-wear. I agree with others that overall the outfit seems a bit overdressed for a daytime reception. In general I feel Meghan does know quite how to dress for the events and her role. Don’t think she’s mastered the transition from actress from California (via Canada) to member of the royal family. 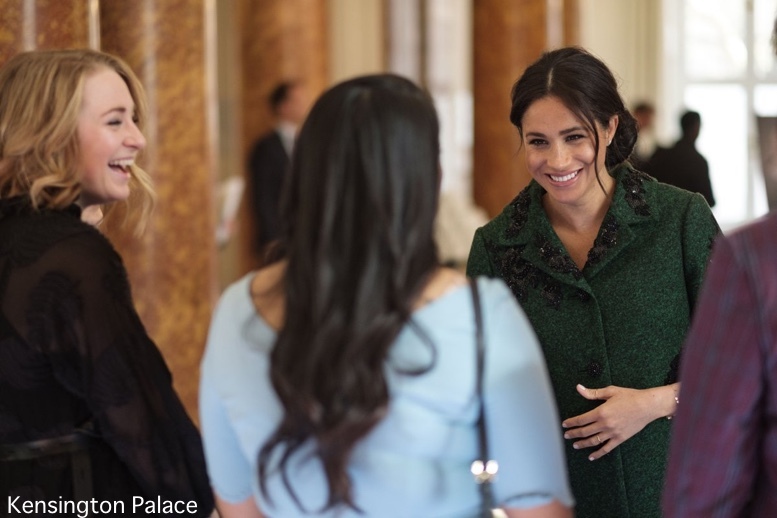 Ann, Meghan’s fashion often baffles me, but the thing that confuses me the most is what you state….she doesn’t always know what is suitable for an event and her role. Really all she has to do is ask…there would be many people to advise her. Love the colour and a bit of bling on the shoulders. The shoes and bag look so stylish and elegant and compliment the outfit. Sure the bare leg police will be out in force but love the fact that Meghan takes the lead and ditches the hose. Go girl!! Although I love Erdem, I find this outfit totally confusing. All that beading for a brief daytime outing just seems terribly overdressed and overstated. This would work so much better at a nighttime outing. I also find the heavy wool mixed with bear legs and open shoes confusing as well. This is a very dressy winter type garment coupled with messy hair. I just don’t see the polished look all of this deserved. Agree Shiela. It’s very pretty but would look better at an evening event. 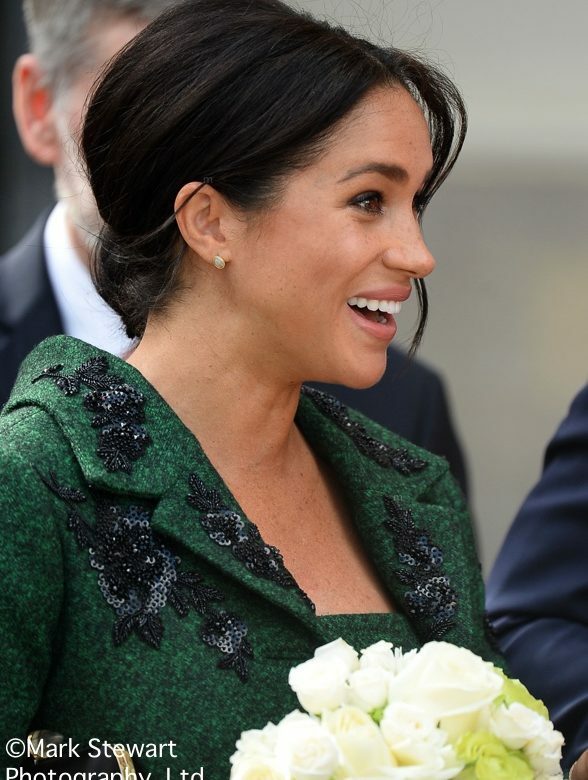 I think this green is lovely on Meghan. Erdem is usually a bit of a miss for me but I love this material and color. I look at her glowing visage and her still-slim ankles and think that she wears her pregnancy very well. If she feels as well as she looks, she’s having a wonderful pregnancy! I’m sorry but I do not think chic is the word to describe this look at all while I do love the color. For me all this does is make her look like she is drowning in fabric and the dress underneath is so unflattering. While Meghan has successfully played with extreme volume before; namely the vintage coat from her baby shower in New York, that was a shorter coat which was then balanced by the skinny jeans. The length here, lack of proportional juxtaposition as well as the heaviness of the fabric all combine to overwhelm rather than enhance. I also prefer her hair parted to the side with more volume, which also would have added more balance. But I suspect because she was wearing a hat later she did not want to have to change the hairstyle. Really like this outfit. I’m all for an outline that skims over the bump without flaring out or cutting back in, underneath it. 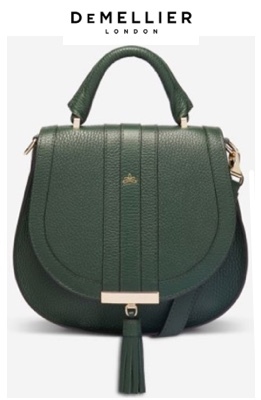 The jewel green is good on the Duchess too. Her version is better than the one on the model, too! Well for Erdem this outfit is somewhat restrained. I like the fact, that the coat is roomy enough to allow for it to be buttoned. I read on another site, that the embellishment is called Doria beaded embroidery, so a nice nod to Meghan’s mother. The dress underneath looks increibly bulky and it does not drape well. If, as it looks in photos, is made from coat weight wool, it is perhaps too heavy. Meghan’s makeup looks very natural today. Nice color and style. It seems too formal for the event in my opinion. The sequins are oddly placed, but overall an interesting look. I am really enjoying that she is experimenting with different designs, fabrics, and cuts during her pregnancy. 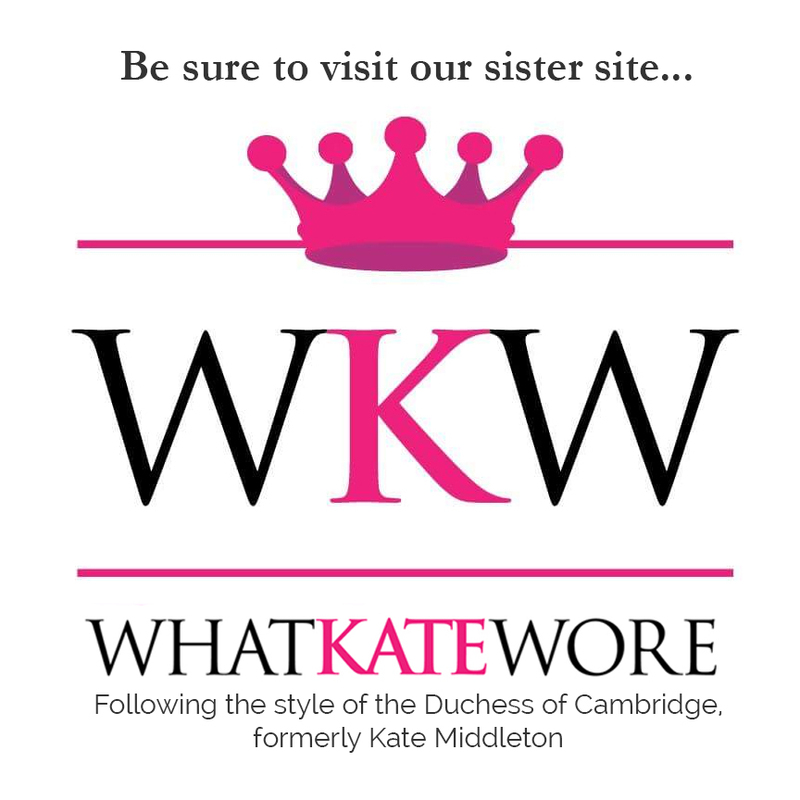 It’s a treat because you can never predict what she will be wearing unlike other royals who gravitate towards the same go to designs and designers. It’s great to see Meghan taking part in an event honoring Canada, given her relationship to the country. I believe that she’s the only working royal who’s lived long-term elsewhere in the commonwealth, and I hope that connection is something that the Royal Family continues to take advantage of. Meghan’s Erdem ensemble is absolutely stunning and may be the most regal thing she’s worn to date. The fit is absolutely impeccable, and I love the variegated green fabric and black sequin embellishments. 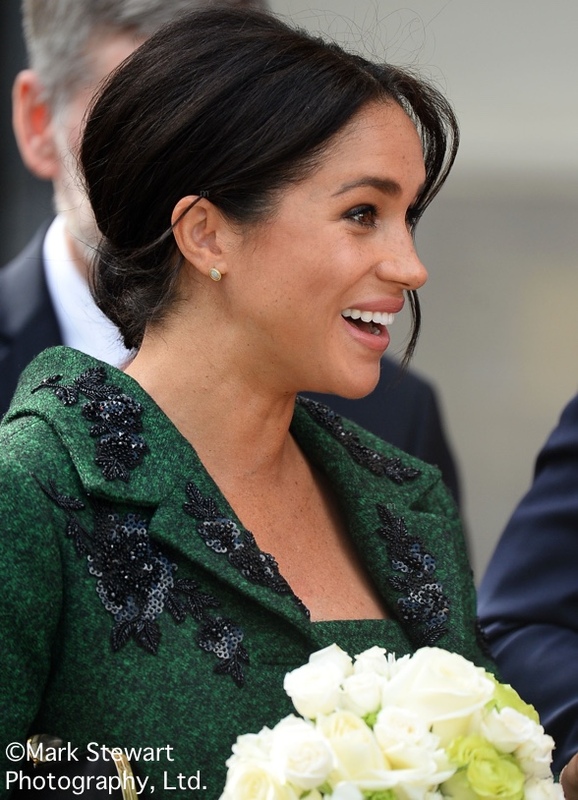 I don’t think she could have struck a better diplomatic tone than she did here–wearing a London-based, Canadian-born designer and Birks earrings–and love that she opted for green and not the more obvious red. Her black shoes and clutch are understated and elegant, and while I would have loved to see emeralds or diamonds from the Queen or Diana here, the opal earrings are a nice touch. 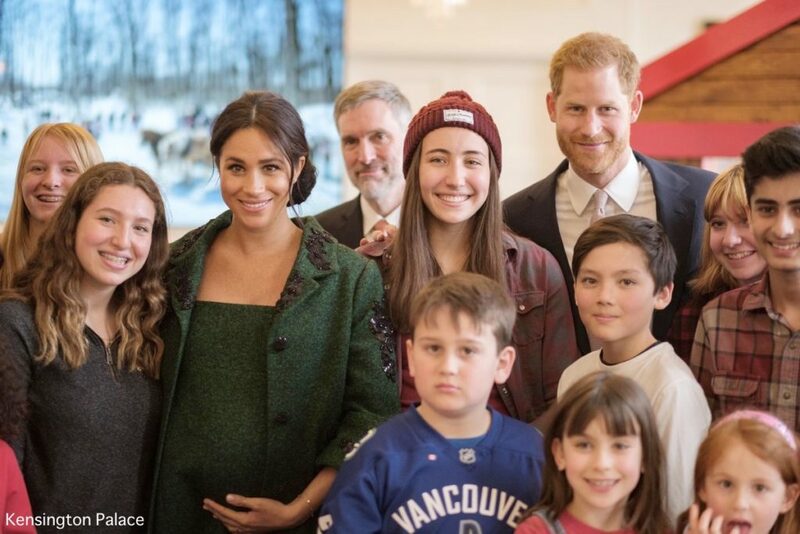 I imagine that whether or not we’ll see this ensemble again is contingent on a second pregnancy (although at least the coat could likely be taken in), but I reeeally hope she repeats it with a hat at some point. This would be stunning with a black pillbox or one of Philip Treacy’s structural berets (or any number of other hats). Hat or no hat, this has to be one of her best-ever looks and I hope that things like this become a staple of her royal style. The color is gorgeous, the embellishments are divine, Meghan is beautiful and glowing, but the fit of the coat is strange. It gapes weirdly across the back of the neck. The neckline of the dress also doesn’t seem to work with the coat. This is an outfit I hope gets recut and made to fit better after she has the baby. It has so much potential. I should love this as I adore green, but I find myself the odd woman out. YES to Pessa’s observation about the weird neckline of the dress. It appears that it could be strapless, which is a strange choice for a woolly fabric and a day engagement. I’m not sure where the fit is trying to go. I’d also love to see this made over or worn as simply a coat dress. I can’t believe I dislike it! I really didn’t like this coat at first glance, but later pics helped bring me round. I think I may also fall into a retro trap as a coat that looks like one my grandmother might have kept in mothballs, until the day she came, camphor-scented, to visit us ,will look fresh and original a couple of generations later. The close-ups of the embellishment alone, however, are enough to get my vote, it’s truly beautiful work and typical of Erdem. I think there may be some problem in that the fabric is dense and bulky which I don’t think Meghan needs just now, she’s managed to stick with some lovely light flowing fabrics most of the time. I’m also a bit sorry in that I think Meghan has reduced the amount of embellishment compared with the runway version, I think this is a case where a funky look depends on more decoration rather than less. By reducing it I can’t help feeling the remaining sections look a bit lost. One thing that really made the outfit for me was when Meghan revealed she has a whole matching dress underneath — this is serious royal territory and Meghan has come to it early. Of course, an extra layer of boucle fabric is going to add to heaviness, especially given that anything she wears right now must end up looking like a tent. I think she has found the absolute perfect outfit for those Aquazurra pumps, the bow really chimes with the coat embellishment and her legs are rendered beautiful and elegant. Love the neat clutch, plus earrings and updo. Be still my heart; this might be my favorite outfit of hers ever. She looks stunning in these 60’s mod fashions! This is so lady-like and chic, yet still has a playful element with that sparkling embroidery. One of my favourite outfits. I love the beaded coat and dress. They are beautiful and stylish. The fit is lovely and the colour really suits her. Lovely bag and shoes that complement the outfit. I’d love some emerald or jet earrings to match maybe on another occasion but the opal earrings are lovely too. I’d love to see her in the green pantsuit (with the very cool button detail at the ankles) in a few months! That suit really caught my eye, too! So chic and as we know, Meghan can rock a pantsuit. I am looooving this! 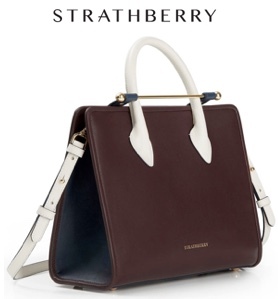 The whole thing is so chic and is very ladylike. I really like the texture of the coat itself and Im not usually a fan of Erdem (thinking of Kates gold dress for one🤔) but this is pretty! We get a peek of what looks like an empire waist on the dress, it looks very flattering on Meghan. The makeup and hair are glowing and effortless. And its green 💚 so of course I like this outfit haha..
Can I get an amen?? This outfit is a stunner and Meghan looks amazing. The tailoring? Yes! The maternity cut? Yes! The shoes? Yes yes YES! Love. Is this the first time she’s worn green since the engagement day dress? It looks lovely on her but I can’t recall any other green outfits since November 2017. My initial assumption was that this was a vintage maternity outfit. The coat is similar in style to the black brocade she wore in New York recently. The coat style, length and 3/4 sleeves are all lovely. The collar seems to hang down on the back in pictures where is it buttoned up, but sits better in the last picture when it’s left unbuttoned. The black beading is interesting but I think less of it would have been better. Perhaps just the cuffs and skip all the beading on the collar. While I generally like this outfit it seems very woolly and wintery, especially since she wore that fine gauge black and white dress so recently. I’m not based in the UK so I’m not sure if the weather there is swinging wildly from mild to freezing, but those two outfits seem like they are for two different seasons, not engagements a couple of days apart. Loved seeing those shoes again – they are like beautiful works of art. One of her best looks to date! 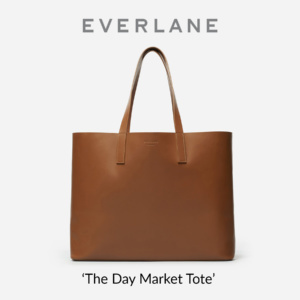 I love the color of this and the nod to the designer. I especially like the changes to the coat with the fewer embellishments when compared to the runway look. This almost strapless looking dress seems inappropriate for a morning meeting. Ditto the silver/gold brocade dress for Prince Charles’ 50th investure party which was in the afternoon & where the Queen & Princess Anne were in tweed! Princess Anne and the Queen often wear tweed. Anne’s is likely from 20+ years ago as she often re-wears her stuff, so I wouldn’t base what one “should” wear based on what clearly works for HM and P. Anne. 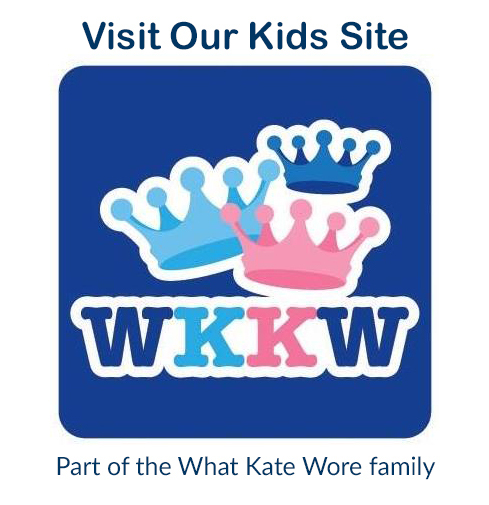 Meghan and Kate are not from that generation and should feel free to dress how they want. Men have it easy – put on a good fitting suit and go. Color was nice and the vintage coat a la 1960s is very chic for pregnancy. But the strapless look is strange too. The bodice is an empire-waist thing? It draws attention to her chest and that’s why despite being heavy tweed, it seems somehow evening to me too. Anyway, I like her more natural make-up look she’s been sporting recently. Sometimes she gets really heavy-handed with the highlighter for day-time events.